jalopyhead.com | My Pooy Baby! Yesterday (April 10), after we came home from our walk, I was putting Anna’s stroller away when I heard that blood curdling scream that every parent dreads. I went to see what had happened and realized that Anna had gone to our water machine and turned on the hot (boiling hot) water. It ran down her arm and burned it. I felt awful, my nightmare had come true. We have talked about how dangerous having a toddler and hot water in her reach but never did anything to prevent it (except the occasional “no! that’s dangerous!” and a spank). You can imagine the pain Anna was in if you have ever burned your self. 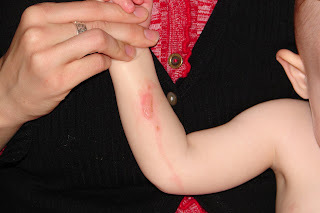 Well, she had boiling water poured down her right arm! She was screaming and I was trying to remember what to do. I finally came to my senses and took off her clothes and placed her arm in the sink and ran cool water over it. I called Jeremy in to take over so I could make some phone calls. After talking with Sue Bassett and a Doctor and seeing a few blisters appear (and the big one popped just from the water running over it) we decided to take her to the hospital. After the doctor prescribed medication he took us upstairs where they were going to administer the treatment. We walked into the IV room/nurses station. This room was full of parents holding their babies who where all hooked up to IVs. Since that room was all full they took us to their private room (which costs extra). The ironic thing was that we SHARED our more expensive “private” room! The nurses took some blood and gave Anna a test to see if she needed an IV of antibiotics. Next, they cleaned her burn and then popped the other two blisters. Then they set us up in front of an electromagnetic lamp where I had to hold down Anna’s arm for 10 minutes while she fought and screamed! Finally, they put some smelly brown cream on her arm and wrapped it up with gauze. You would think that the torture was over, but it had only began. 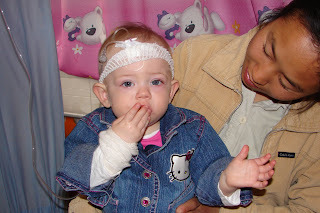 Next, they took us to the nurses station where they laid Anna down, wrapped her arms like a mummy and made me help hold her down while the nurse put on IV in her forehead! (Fortunately, I was prepared for this since when I first walking into the “IV room” I saw many babies set up just like this.) I was then able to take her in my arms, go back to our “private” room and distract her from pulling out the IV. There is not much left to the story. We waited for the IV to finish and then went home. We had to go back today for the second dose of antibiotics and a clean dressing (which Anna did not cry as much for). Anna is pretty much back to her fun, busy self. We are all glad that it is over and have turned off the hot water so it won’t happen again. I took a picture of Anna with her IV (the bandage is there to keep it in place) and you can see her arm (right) bandaged up. The Chinese woman is our helper who comes and takes care of Anna in the morning and cooks lunch for us. This picture is her wound 24 hours after the incident. It looks 100% better then even this morning, but is still not a pleasant sight.